Why is the Federal Reserve raising interest rates? What’s the impact? The simple answer: The Fed is raising interest rates to slow the growth of the economy—at least slow relative to what the growth rate would otherwise be. This will likely restrain growth of employment and maintain the lack of growth in wages, especially the wages of non-supervisory workers. The Fed’s action is also likely to keep inflation at bay. What Have They Done and How Do They Do It? In mid-June, the Federal Reserve announced that it was raising interest rates for the second time in 2018, and indicated that two more rate increase were on the way for later in the year and more would come in 2019. The Fed raised its ‘benchmark rate’ to a range of 1.75% to 2%. The benchmark rate is the ‘federal funds rate,’ which is the rate at which banks borrow short-term from each other. It is the rate most directly affected by the Fed, and it affects other interest rates throughout the economy. The Fed can bring about this increase of interest rates by selling government bonds that it currently holds and thus taking money (the payments for the bonds) out of circulation. With less money in circulation, the price of money—interest rates—will tend to rise. The Fed’s bond holdings are especially large because it bought huge quantities of bonds during and after the Great Recession, putting money into the economy and pushing down interest rates to near zero. Announcing the June action, the Chairman of the Fed, Jerome H. Powell, stated, ‘The decision you see today is another sign that the U.S. economy is in great shape. Most people who want to find jobs are finding them.’ Insofar as this is actually the case, the Fed authorities believe it is no longer necessary to maintain low interest rates as a means to stimulate economic activity. Further, they believe that additional stimulation at this time could induce inflation. The Fed’s action will tend to push up interest rates throughout the economy for consumers and for investors, on everything from new car loans and credit card debt to mortgages, from construction loans to loans for new equipment purchases. These interest rate increases may not be immediate but they will come. And they will reduce economic activity relative to what it otherwise would have been. But is the U.S. economy really in ‘great shape’? Advocates of the ‘great shape’ appraisal cite what they claim is a strong rate of economic growth and a very low unemployment rate as prime evidence that the economy is doing well. 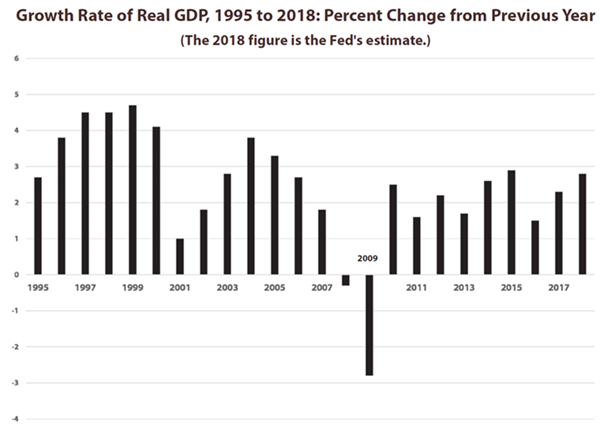 As to the rate of economic growth, it is only rapid in relation to the years since the Great Recession. (See chart.) Even by that standard, GDP is not doing especially well. The Fed’s growth forecast for 2018 is only 2.8%. While higher than the rate for 2016 and 2017, this is below the 2.9% growth of 2015. Source: U.S. Department of Commerce, Bureau of Economic Analysis (bea.gov). The unemployment rate, 3.8% of the workforce in June, is quite low, lower than it has been since the late 1960s. However, the labor force participation rate (LFPR)—the percentage of people 16 and older employed or looking for employment—has been dropping since the beginning of the century and has dropped sharply since the Great Recession. In each of the four years from 2005 to 2008, the LFRP was slightly over 66%. In each of the five years from 2014 to 2018 (as of May), the LFRP has been slightly below 63%, with no apparent trend. If the participation rate were as high today as it was in those years before the Great Recession, about 7.7 million more people would be in the labor force. These figures suggest that the labor market may not be so ‘tight’ as the 3.8% figure suggests. While some of the decline of the LFPR is due to the aging of the population (baby boomers leaving the labor force), much of the decline is due to people having given up on finding jobs—so-called ‘discouraged workers.’ If the Fed were to keep interest rates low, continuing to stimulate growth, jobs might be available for this discouraged group. Most important, continued stimulation might get wages moving upward. Though the Fed chairman says the economy is in ‘great shape,’ wages of non-supervisory workers remain stagnant. Between May 2017 and May 2018 (the most recent month for which data are available), the average wage increase of non-supervisory workers in the private sector was completely wiped out by inflation. There are several factors that contribute to this wage stagnation, including, for example, the small number of workers who are unionized, the power of large firms to set wages, and international competition. Yet slow economic growth is also a factor. More rapid and lasting economic growth would give workers—even without unions—more bargaining power because they would have more options. The interest rate increase undertaken by the Fed, however, will tend to keep wage growth in check. SOURCES: Jim Tankersley and Neil Irwin, ‘With the Economy Near ‘Normal,’ Fed Sticks to Plan to Lift Rates,’ The New York Times, June 14, 2018; Arthur MacEwan and John Miller, ‘The U.S. Economy: What is Going On?’ New Labor Forum, Vol. 27, Issue 2, Spring 2018.